Jaguar has taken last year's stunning 'Concept Eight' show car and turned it into the new, super-exclusive, limited edition 2006 Super V8 Portfolio production sedan, which will go on sale late this summer. Unveiled at the New York International Auto Show (March 26-April 3), the Super V8 Portfolio took Jaguar's flagship long-wheelbase, supercharged Super V8 model and transformed it into the ultimate luxury Jaguar sedan. The car's dramatic exterior features sculpted aluminum power vents in the front fenders, a distinctive mesh grille, polished 20-inch 'Callisto' alloy wheels created specially for the Super V8 Portfolio, and two stunning new exterior colors - Black Cherry and Winter Gold. Inside, the Super V8 Portfolio is again closely based on the Concept Eight's design cues, with individual power-adjustable rear seats separated by a large center console. The cabin itself is trimmed in soft-grained, hand-stitched leather and satin-finished black walnut veneer, with a suede-like leather head-lining, and aluminum surround for the J-gate shifter. For an even quieter cabin, the side windows are made of laminated glass. To entertain those in the back, there's a DVD system with twin rear display screens, a 400-watt Alpine surround-sound audio system with Dolby Pro-Logic II sound processing, and Bluetooth® mobile telephone connectivity. Powered by Jaguar's 4.2-liter supercharged AJ-V8, which gets a 10 bhp increase for 2006 to take maximum power up to 400 bhp (SAE), the advanced aluminum-structured Super V8 Portfolio can accelerate from 0-60 mph in just 5.0 seconds and has an electronically limited top speed of 155 mph. 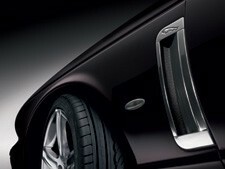 "The Super V8 Portfolio will be the most luxurious, most exclusive, most technically advanced Jaguar ever built. 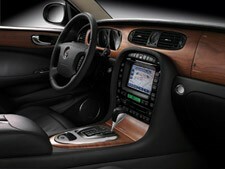 It is a true flagship for the Jaguar range," said C.J. O'Donnell, executive vice president of Marketing, Sales and Communications for Jaguar North America. "The decision to conduct an agency review was part of our strategy to refocus our market positioning and external communications on Jaguar's unique values," explained Jaguar Managing Director, Bibiana Boerio. "Working together with Euro RSCG/Fuel, we will move our communications and the Jaguar brand forward. "Jaguar has its sights set on the future, with a multi-faceted plan that includes great new products," continued Boerio. "We gave an insight into this new generation of beautiful, fast cars with the Advanced Lightweight Coupe, which has received widespread recognition since its January debut in Detroit at the North American International Auto Show." Jaguar and Euro RSCG/Fuel are working on the themes and ideas presented during the review process, with a view to developing an integrated campaign that will break later this year. "We are tremendously excited to be working with Jaguar," said Euro RSCG/Fuel Global CEO Jim Heekin. "The Jaguar brand has significant equity around the world and we believe we can work with the Jaguar management team to capture the imagination of its existing and potential buyers. We are ready to hit the ground running." Jaguar will continue its relationships with WPP subsidiaries, MindShare, Wunderman and mediaedge:cia. Jaguar North America announced the Manufacturer's Suggested Retail Prices (MSRP) for the 2006 XK derivatives - including the 2006 XK Victory Editions as well as revised MSRPs for the 2005 XJ and S-TYPE luxury sedans. The iconic 2006 Jaguar XK sports car range offers even more exclusivity and sporty style with the addition of the 2006 Jaguar XK 'Victory' limited editions. Celebrating Jaguar's four championship wins in the North American Trans-Am road racing series and adding to a successful lineage of special and limited edition XKs introduced over the past eight years, the 2006 XK 'Victory' editions are available in both coupe and convertible derivatives of the XK8 and the supercharged XKR. "The XK name became the signature for Jaguar's sports cars with the introduction of the XK120 in 1948. With sensuous lines, rich appointments and thrilling performance, Jaguar XKs have remained on the shopping list of automotive enthusiasts for more than six decades," stated C.J. O'Donnell, executive vice president, Marketing, Sales and Communications for Jaguar North America. The limited edition 2006 XK 'Victory' sports cars are fitted with exclusive upgrades, including unique checkered flag details on the badge as well as the treadplates, standard Bluetooth® connectivity, distinct interior trim options, special wheels, soft-grain leather seating surfaces, finely crafted leather-edged floor mats and many other luxurious features. Jaguar also announced revised Manufacturer's Suggested Retail Prices (MSRPs) for two models in its product line up - the 2005 S-TYPE mid-size luxury sedans and the full-size 2005 XJ sedans. Pricing for the 2005 X-TYPE sedan, X-TYPE Sportwagon and XK sports cars remain unchanged. Prices of option packs and individual available options will remain unchanged on the 2005 S-TYPE and XJ models. 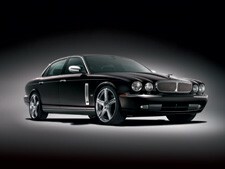 Jaguar's premier Select Edition Certified Pre-Owned Program has received yet another major accolade. It has been recognized by top Spanish automotive magazine, AutoMundo, as the 'Best Certified Pre-Owned Program' of 2005. This follows Jaguar Select Edition's receipt of the coveted IntelliChoice® award for 'Best Certified Pre-Owned Vehicle Program' in the luxury class segment for the fourth consecutive year. "In evaluating the numerous certified used car programs available to consumers, Jaguar Select Edition stood out amongst its rivals," said Jorge J. Koechlin, publisher of AutoMundo Magazine. "We recognize and reward the opportunity to buy a luxury Jaguar with a full warranty at an affordable price," praised Koechlin. Jaguar Select Edition vehicles are subject to a stringent 140-point quality and reliability inspection, enabling a 6-year/100,000-mile limited warranty on all vehicles. "Jaguar Select Edition is proud to be recognized by AutoMundo for our industry-leading Certified Pre-owned Program," said Miah Bradbury, national remarketing manager, Jaguar North America. Jaguar Select Edition offers consumers significant value, giving buyers access to the exclusivity of the Jaguar brand at a significantly lower price, while assuring them of the vehicle's quality and dependability. Stefanie Powers has been stepping out on to a different kind of stage to promote the preservation of the jaguar. The star of 'The King and I' has been taking time off between stage performances to talk to consumers at Jaguar dealer showrooms about the protection of the big cat. So far, Jaguar dealers in Detroit and Delaware have organized showroom events where customers hear Ms. Powers talk about the work of the Jaguar Conservation Trust. More events are planned throughout 2005. Two years ago, Jaguar North America appointed Ms. Powers to head-up the Jaguar Conservation Trust to look at ways to help protect the jaguar in its natural habitat. One of her aims is to encourage Jaguar dealers around the country to get involved with the Trust's conservation efforts, and to use their showrooms and service areas to educate customers. "The more the consumer knows about what we are doing, the more they will realize they can participate, and join Jaguar in saving the jaguar. We need to ignite a passion," said Ms. Powers.